World-renowned martial arts instructor Iain Abernethy is coming to Southern California for the first time. Sensei Abernethy is one of the world’s preeminent instructors of applied karate and practical kata application (bunkai/bunghai) and his seminars are in high demand internationally. This is not prearranged one-step sparring or elaborate responses dependent upon a specific attack. Instead, the bunkai he teaches are simple, direct, practical and effective applications and concepts taken directly from the kata. 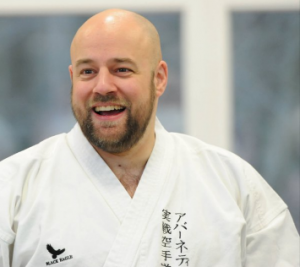 Sensei Abernethy has been involved in the martial arts since childhood and currently holds a 6th Dan with the British Combat Association (awarded by Peter Consterdine 9th Dan and Geoff Thompson 8th Dan), the English Karate Federation, and the British Karate Association. He is also a member of the Combat Hall of Fame and his series of martial arts DVDs, books, articles, podcasts, and You-Tube videos have transformed and added a new dimension to martial arts. For more information on Iain Abernethy, see www.iainabernethy.com. This seminar is not to be missed by the serious martial artist.